I made this cake months ago but waited until now to publish it to avoid bothering you with my too-much-candied-orange-peel drama. The recipe was a simple orange cake – which is something I love – spiced with a bit of cardamom – which is something I’ve learned to love – and I just added the bits of candied peel because I no longer wanted to look at them every time I opened my fridge. So it is completely up to you to decide how you want to bake this cake – I just urge you to do it, because it is delicious and oh, so tender. And speaking of pound cakes, I’m looking for a good 9x5in loaf pan and would love to know there’s a brand you would recommend; I’ve browsed some at Amazon but haven’t chosen yet – your opinion would be very useful to me. Thanks! Preheat the oven to 180°C/350°F and position an oven rack in the center. Butter a 21x11cm (8½x4½ in) loaf pan and line with baking paper; butter the paper as well. In the large bowl of an electric mixer, cream the butter, sugar, zest and cardamom until light and fluffy. Scrape down the bowl with the spatula. Add the eggs, one at a time, beating well after each addition. Beat in the vanilla. Scrape the bowl occasionally. On low speed, add the sifted ingredients in three additions alternating with the sour cream in two additions (begin and end with the dry ingredients). Stir in the candied orange zest (if using). Transfer batter to prepared pan, smooth the top then bake for 45-55 minutes, until firm to touch and a toothpick inserted into the center comes out clean. Transfer to a rack to cool completely. When cool, remove from the pan and peel off the paper. Glaze: sift the confectioners’ sugar into a small bowl and gradually add the orange juice, stirring until desired consistency. Pour over the cooled cake. Set aside for 30 minutes before serving. USA pans are great. They also make the King Arthur Flour pans but just exchange the logos. I am really interested in what bakeware you decide. I think bakeware is as important as the recipe. She said to buy professional grade pans. She also uses a wrap so the cake does not mound. I highly, highly recommend Williams-Sonoma pans. Ever since I bought them, my breads have risen hire than I imagined (and they rose nicely before, as well... this was just even better!). For my loaf pan, I love the Goldtouch ones. Usually I wouldn't ever get nonstick, but these ones are excellent. However, I have some of their traditional (not Goldtouch) pans, and they are amazing, too. this is a fantastic looking & sounding recipe... beautiful job! Looks yummy! 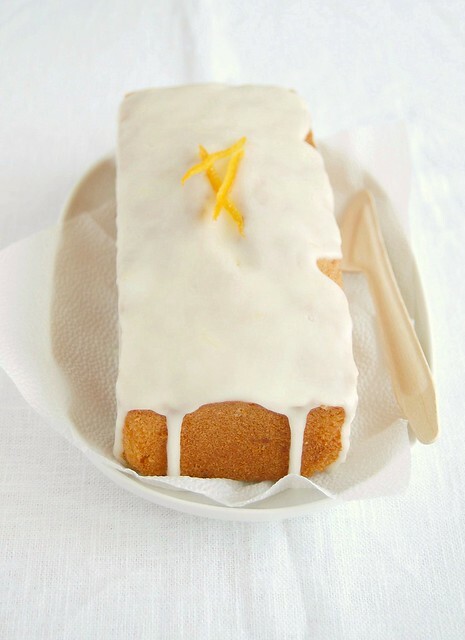 I bet the candied orange peel makes this cake delicious! To be honest, my loaf pans have just come from the grocery store. But I did receive some 9" round cake pans from Williams-Sonoma and let me tell you, those things are heavy duty and really well made! I highly recommend King Arthur Flour web site for their loaf pans. No greasing needed. Thanks for the recipe. Looks great! Girls, thank you all for your great suggestions! Laura, I have three cake pans from WS and love, love, love them! Laurie, I have bought two Bundt pans and one mini loaf pan from WS with that gold touch and they are fabulous! I'll look for more options, thank you! Barbara, I'll check out KAF's website - tks! Just made this cake today - made four mini loaves - and it turned out just amazing. 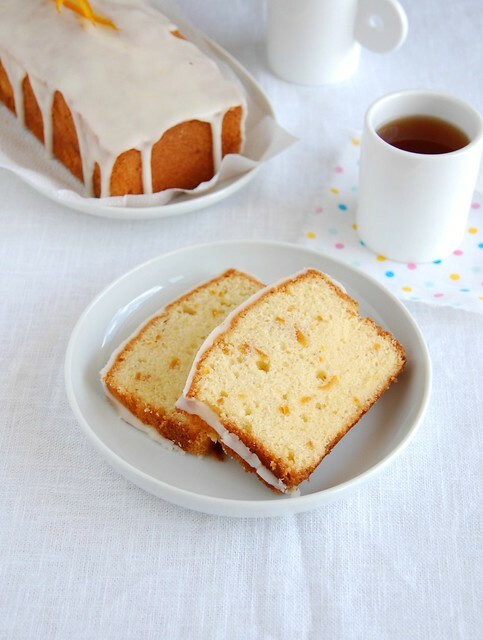 Delicate flavor and not too sweet, which a pound cake should be if it can help it. thanks for sharing this recipe! The only thing I'll do differently next time is add a bit more cardamom (as we love the flavor) and make more loaves!! I'm so glad you liked the recipe! I'm a sucker for all things citrus, you know, so I'm glad to hear someone else's opinion about the cake. Thank you for letting me know how the cake turned out!